Are you up for an Urban Excursion? Don’t confuse Urban Excursion with your average stroll in the park. It’s the mother of all scavenger hunts and urban adventure races. Start recruiting your team of 4 to join us for an adventure through the streets of downtown! 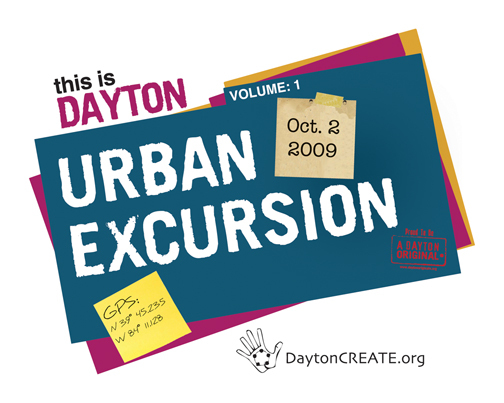 This entry was posted on Thursday, September 17th, 2009 at 5:13 am	and is filed under dayton rocks!. You can follow any responses to this entry through the RSS 2.0 feed. what about teams of 3 or 5? any age restrictions or suggestions? Suggested age is 16 and up. Maximum of 4 on a team. You could play with 3, but it might put you at a disadvantage! So put a team together and come play! I see it is $30. Is that per person or per team? Signed up and received a will call ticket. Where do we meet and what other if any instructions? Teams of 4 are now $30 if you are still trying to register. Once you’ve registered you will get instructions emailed to you! Those instructions do not say where to meet. Please advise.